Build the capital city of Aluminum USA! 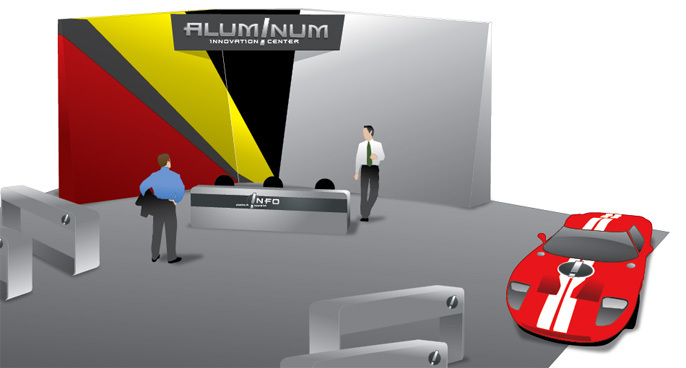 Help the aluminum industry generate excitement about the metal among manufacturers at the NMW trade show. Challenge is an understatement! 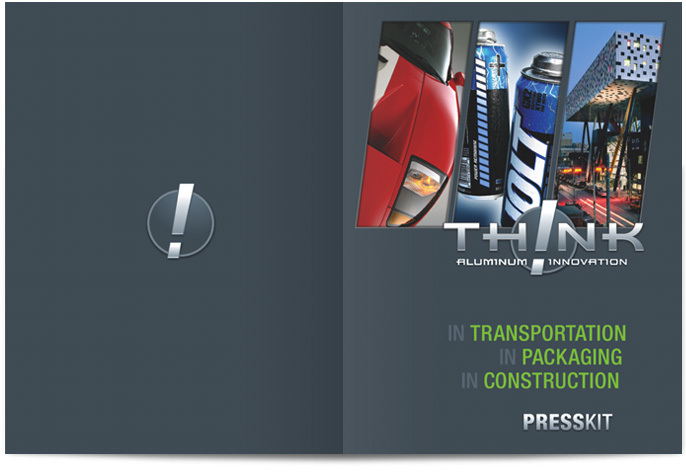 Designing the printed press kits, invitations, ads, and brochures was one thing. Learning the intricacies of designing for beverage cans and diminishing-radius curved walls was something altogether different! 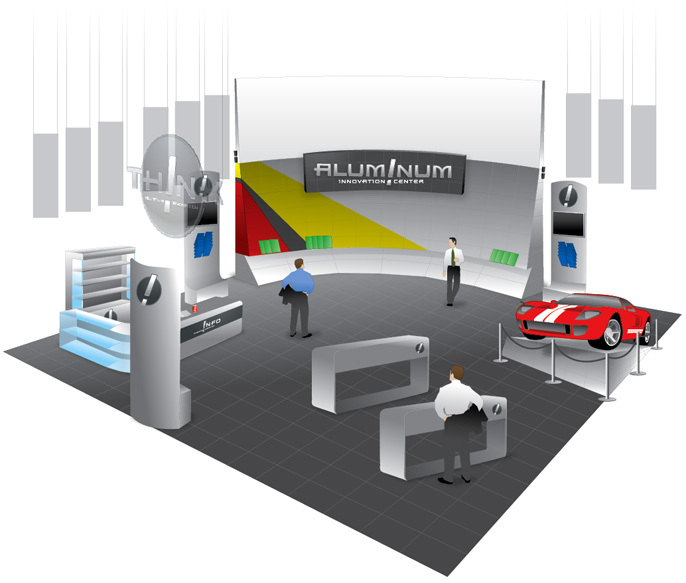 Smart, exciting logo; invitations; media press kit; 4 different videos synced to a common soundtrack; specially designed beverage can; 12-foot-tall aluminum wall; aluminum supercar (Ford GT); aluminum flooring; aluminum chairs; aluminum coasters; signage; multiple bannerups; 15 10-foot-tall banners hanging from the ceiling; and aluminum pens and key chains. Photoshop, Illustrator, Motion, Final Cut Pro, carpenters, partners in the aluminum fabrication industry, coffee, and cartoon toothpicks for our eyelids. This was one of the earliest pieces we created to send out as a save-the-date. 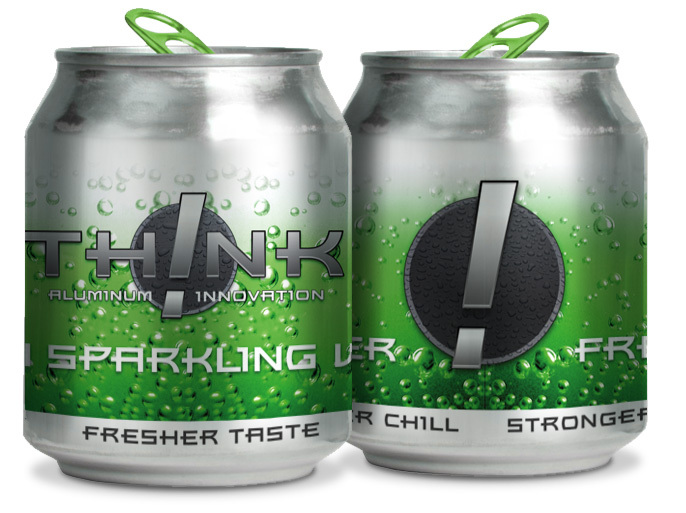 Partnered with Ball Manufacturing to create a specially design squat can as a refreshing give-a-way. 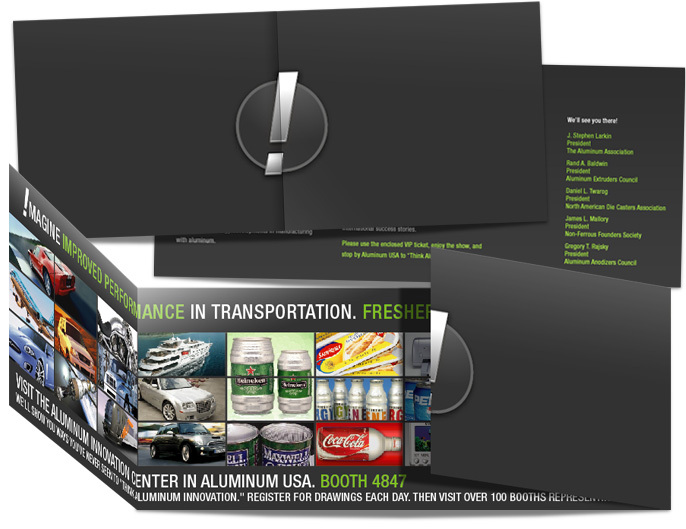 Several BannerUps were designed serving as direction signs in the exhibit hall encouraging visits to the booth, interest-generators in the registration area, and information billboards in the showcase area. 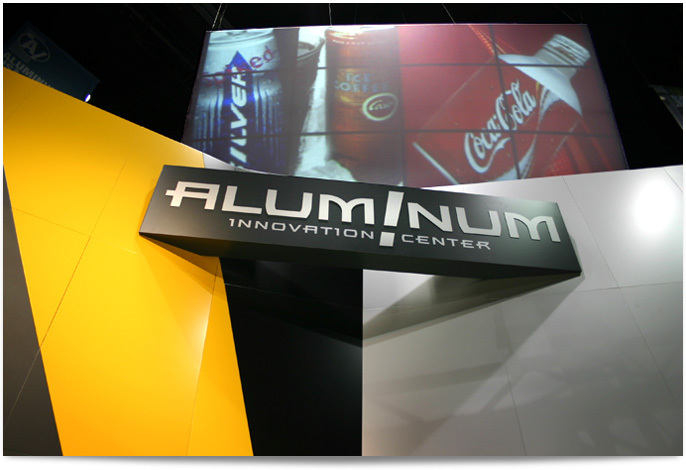 15 10' tall banners hung from the massive ceiling forming a floating perimiter around Aluminum USA. 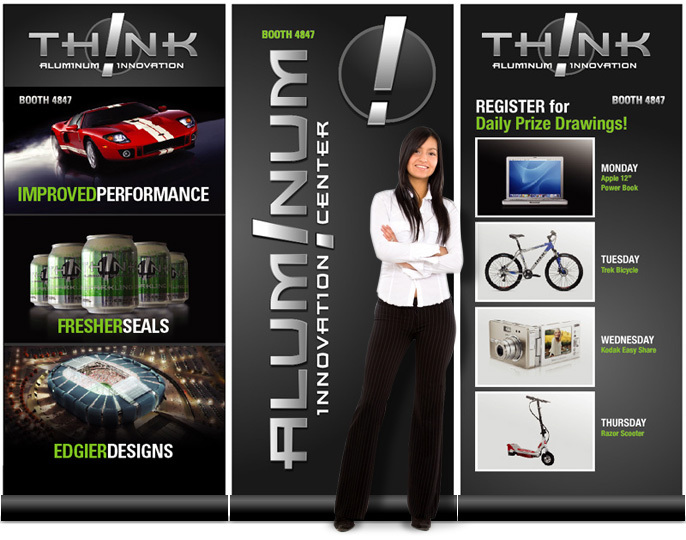 We coordinated the design of the press kit, giant aluminum wall, and current issue of the Aluminum Now magazine to tie the experience together. Visitors received tickets in their registration packs. They looked great and could be turned into awesome aluminum prizes. As a wonderful way of expressing their appreciation, the Aluminum Association brought us to the event to see the results of our work. We busied ourselves taking pictures of the 12-foot aluminum wall, the 16-foot projection screen, cool aluminum chairs, and Ford GT super car, the HD video displays, etc. Three HD flat panel’s were placed around the floor, each playing a different video (all in sync with the same high-energy soundtrack*). Aluminum bottles and cans filled a display cabinet. Not only were videos playing on the 3 HD TV's but a special composite video was projected on a 16-foot screen, high above the wall, for the entire show to see. 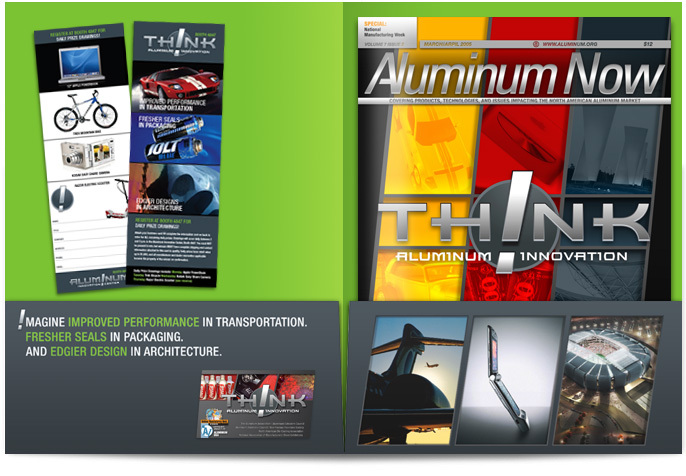 *Note: the three videos each presented unique content, featuring aluminum innovation in transportation, building and construction, and packaging and consumer products. 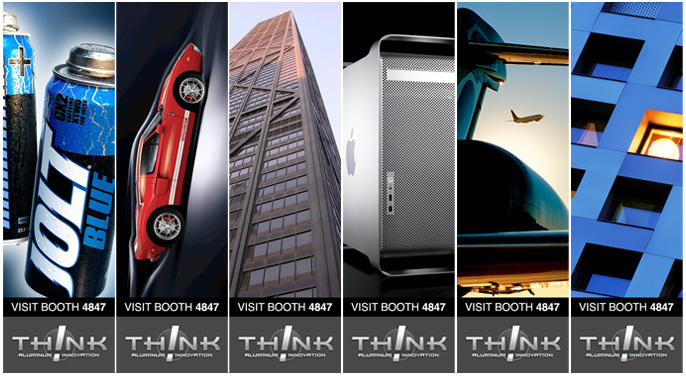 We are still amazed at how closely the final exhibit resembled our initial design ideas. We couldn't be more proud of a project and thankful for a great client.